Description: LV GP38-2s prepare to swap power with a D&H train at Fraser, PA, where the former CNJ and LV trackage split. LV 314 was later D&H 7314, Guilford 220, D&H 7308 and is extant as StL&H 7308. LV 316 was not so lucky, being scrapped in 1996 as D&H 7316. Description: I want to say this is Yale Station Rd., but I'm not at all sure. Remember these three geeps and the three LV green boxcars - they will show up later at Rochester Junction. 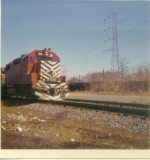 Description: An EMD GP38-2 at Bethlehem in March 1976. Description: Ex-LV 314 idles at Kenwood Yard in Albany.